St. Philip Neri Primary School is an integral part of the Parish of the Lower North Shore. We work closely with the Parish Priest. There is a strong relationship between the school and all parish staff. The parish and school often share resources. The school supports the parish based sacramental programs and is involved in the preparation of the Liturgy for each sacrament. Parents facilitate the sacramental programs by organising parent leaders for groups, communicating between Parish, school and parents and organising the logistics for the actual Sacrament celebrations. The school works with the St Vincent de Paul members of the parish to provide gifts for the children in the Waterloo community at Christmas. As a Catholic school we are committed to developing our children to contribute positively to the wider community. In all aspects of school life we seek to present to children the Catholic Worldview. Within the school, the local community and the wider world community, the students are made aware of the need for justice. This is an essential part of our faith development. Through the Social Justice Program the children are given opportunities to respond to social justice issues throughout the community. We work with parish to support local and world communities. 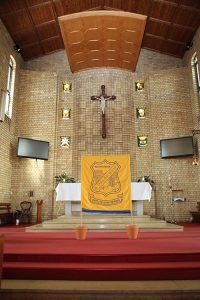 We are currently working collaboratively with the parish of the Lower North Shore to raise funds to support the Lete Feho Parish in East Timor.